This Recipe is so simple to make and tastes delicious.Requires a very few basic Indian Ingredients and dry spices(This list for dry spices in Indian cooking is always so long…. never lets me mention that the ingredients are few!! So I just take the dry spices as one ingredient ) . 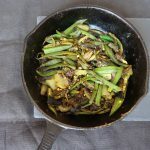 Bhindi/ Okra is one of the favourites in Indian homes during the summers.It is light, savoury, spicy and crispy at the same time, and of course healthy.It can be served as a side dish with any of the Daal’s/ lentils or beans , or even on its own with soft fresh roti’s/ paranthas or poori’s, Just complement it with a side of any yummy Raita(Yoghurt with fresh vegetables or fruit). In India Bhindi is easily available, but here in UK you do not find it as easily. I have a few asian stores around and I get it whenever they have it available. Also my nearest Tesco has started selling Okra, so at times I get it from there, this vegetable is surely starting to get international now..
1.It is nice green and fresh looking.This goes for all vegetables without saying. 2.The slices should not be too thick , and hard.Pick up the pieces which are nice, small, slender and firm. 3.It should be free from any blemishes and holes, as there might be some worms eating your okra, even before you start cooking it!! Im sure you dont want that happening.. 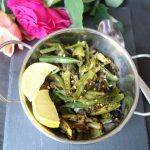 There are tons of ways to make Bhindi/Okra.You can make it dry like Bharwan bhindi (stuffed bhindi), masala bhindi,achari bhindi,Fried bhindi or you can even cook it in gravy.I always like the dry versions of this, because I like it crispy!!! So I’m sharing the below bhindi masala recipe, that I have from my mum. Also I cook it in my cast iron pan, to increase the iron content in my recipe-blink blink!!! not so sure of this ,though my mum always cooks dry vegetables in iron Kadhai saying that it increases iron content, and now I’m reading about this all over the internet as well, but i do believe that your vegetables cook better and taste better if you are cooking in cast iron pans.. hence I have started using it. 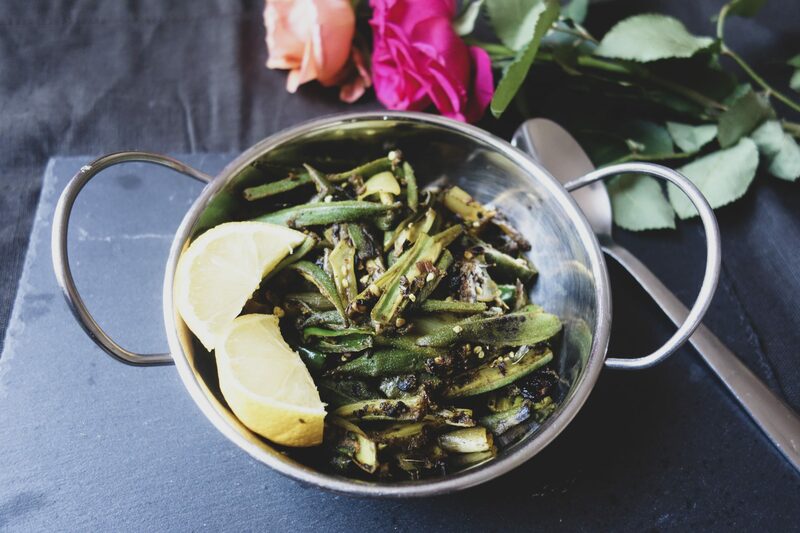 This recipe requires Bhindi(Okra), Onions and Green chillies. The dry spices you need are salt, red chilli powder, turmeric powder,a pinch of asafoetida(hing powder), coriander powder, kasoori methi(crushed dry fenugreek leaves), amchoor(dry mango powder) and besan (chickpea flour).Adding Kasoori methi is optional, this really enhances the flavour of any Indian vegatable and curries.You will find almost all my recipes have kasoori methi as one of the ingredients.But if you do not have it handy, you can skip adding this. Amchoor (dry mango powder), is another important spice to be used in this dish, it adds the required tanginess to this recipe, and also any sour ingredient will help cut the sliminess of the Okra.People add tomatoes in bhindi, but I avoid using tomatoes as I feel, it makes bhindi a little soggy (and ofcourse I then have less chopping to do!!!). If you do not have amchoor, you can add juice of fresh lemon- It does the job as well as amchoor (dry Mando powder). If you like your dish to have this crispiness and crunchiness then adding chickpea flour does the trick.Once the dish is almost cooked, add besan (chickpea flour). It will coat the bhindi slices, and will cook into a nice crispy layer on the outside. The extra tablespoon of oil added , will help cook the flour.If you are not adding besan, you can reduce the qty of oil added in the beginning. Wash the Okra thoroughly in water, and pat dry with kitchen roll. It should be completely dry before cooking. Cut the edges on both ends, and slit the okra in half or three slices, depending on the size of each piece. Keep them aside. Cut round slices almost 1/4" if you do not want the long slices..Your call. Heat the oil, and add the cut onions. Saute the onions for 2-3 minutes (do not brown the onions). Then add sliced lady finger/Okra, and mix. Add Salt/ Haldi (Turmeric powder), red chilli powder, Hing powder (asafoetida),Coriander powder,Kasoori methi (dry fenugreek leaves), and amchoor powder(dry mango powder).If you are replacing amchoor powder with lemon juice, add the same. Saute on full heat, without covering.You need to keep stirring, till the sliminess/ stickiness is all gone. You can taste it, and if the okra is now soft and tender, it is cooked.Adjust seasoning if you want to. Add the besan/ chickpea flour, mix it thoroughly with Okra, and cook for 4-5 minutes till the Bhindi is all coated with flour and the it is nicely cooked and crispy. Serve it hot with Fresh Rotis/ Paranthas/ poori's !!!! We add extra tablespoon of oil, as in this recipe as we are adding the besan/ chickpea flour (like we did in the masala arbi recipe) to make the vegetable crispy. The chickpea flour / besan absorbs the extra oil and helps to blend and cook the flour nicely to give Bhindi/ Okra a crispy texture.